The case is murder. The victim was involved in illegal abalone trading and even more illegal drug trafficking. And the witnesses aren't talking. As Dauphin closes ranks around him, Charlie finds his interest in the law powerfully reignited. Charlie Jardim is trying to put together a case to prosecute the victim's murderers. The account given of events by the victim's brother just does not hang together so Jardim travels to a small seaside Victorian town to see if he can get people to talk. Eventually he befriends the victim's brother and gets a different version of what occurred, and more importantly, gets him to agree to replace the original statement that the police have on record. But this is just the start of the plot. There is a strong Australian flavour to this recording reinforced both by the language particularly the dialogue, but also by the narrator's voice. There are superb descriptions of the Victorian countryside, of the heat, of the declining nature of the town, of the way things are ruled by one family, and the way others have to take drastic measures to survive. 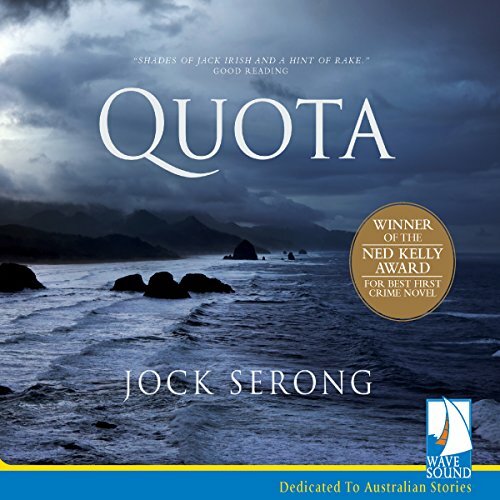 QUOTA is Serong's first novel and didn't get the same attention and recognition that his later novels have. I think taht is possibly because his voice is so different to other Australian crime fiction writers.